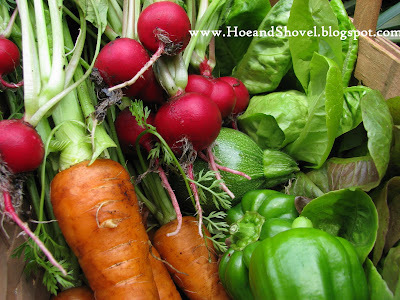 Hoe and Shovel: What's That Divine Scent in the Veggie Garden? What's That Divine Scent in the Veggie Garden? Vegetables and herbs have their very own wonderfully distinct fragrances don't they!? One of my favorite things to do while milling about the garden is to pinch off a robust leaf from a nearby tomato plant, crush it in my hand, and breathe deeply of its unique and earthy aroma. And so it goes with cilantro and basil which penetrates my skin--handy for subsequent whiffs. Snapping a stem of lavender on my pass-by signals an unmistakably dreamy aroma. My vegetable garden is located in the side yard. From the backyard you are welcome to come through the gate with me to have a look. Can you see the pole beans reaching high on their stakes decidedly above the 4 foot fence line? The oak trees in the background are located in the front-side yard providing shade to the veggies from the intense afternoon sun. As you approach the vegetable garden, from either the back gate or the front opening at the other end, you will be greeted by the intensely exotic scent of the vine that graces the perimeter on three sides. 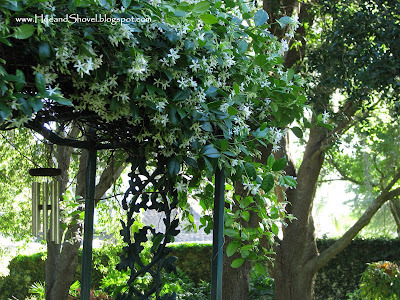 Trachelospermum jasminoides Confederate jasmine or star jasmine is lushly evergreen all year long until it flowers... faithfully... every April. That's when the tiny, creamy white, pinwheel-shaped flowers each containing their own potent, heady scent burst forth in contrast against the deep green leaves. The blooms last about 6-8 weeks with no special attention given before or after. Those singular pinwheel blossoms when bunched together along the stretch of 60 feet of fence on one side and 30 feet on the gated side become a sweet fragrance wafting through the air that is oh, so inviting and intoxicating at the same time. The vine was planted many years before the veggie garden. The goal was to cover the (undesirable-look-of) chain linked fence which was erected to give the dog (now in doggie heaven) a place of protection.The jasmine covered fence now serves as protection for the garden from the occasional winds/storms and it keeps away roaming dogs (usually) or other small animals that would otherwise have open access to the tender plants. That's not saying that predators can't find a way in but for the most part it does seem to have helped keep any wandering traffic down. Peacocks, I realize, have been another story. But now that I have the front opening contained the peacocks haven't been a problem either. The multitude of tiny white clusters are a magnet for bees, flies, wasps, and butterflies of all kinds. Isn't that handy? It protects and it draws in the beneficial insects that find their way to the veggies as well. 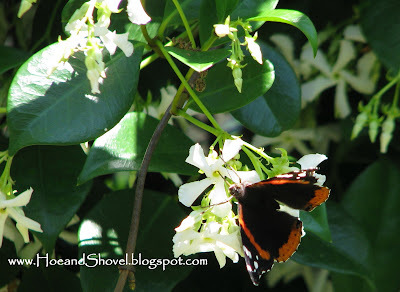 The sweet, clean, and reminiscent of orange blossoms scent of jasmine fills up my senses in the back garden, too. It clambers up one side and climbs over the top of the arbor that bridges the pathway between two of the garden beds. I've purposely kept it off the opposite side which has been home to a variety of other vines over the years. Currently their is a fairly new Queen's Wreath traveling up the opposite side. While writing this post today, I recollected writing about this last year. In looking back to re-read that post I found it was exactly one year ago to date. Don't you just find that little tidbit most fascinating? 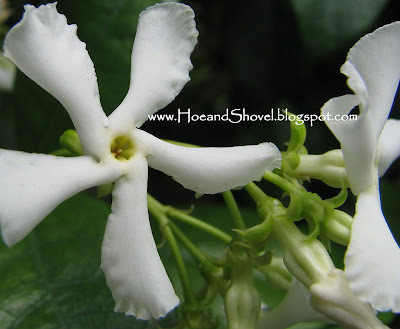 Not as fascinating as this wonderfully, vining jasmine... but quite interesting all the same. Be sure to check back Monday. Hoe and Shovel has been invited to join blogs from around this great country for my humble opinion of "The Six Plants I Can't Live Without." There will be many zones represented with posts from Alabama, California, Florida, Illinois, Massachusetts, Missouri, North Carolina, Tennessee, and Texas. Love the jasmine. I have tried to grow it in a pot since it isn't hardy here. I envy you the show and especially the fragrance. Meems....it is to die for! Lovely lovely...what time did you say the daily tour begins??? Am I understanding that the veggies are in what was once the dog yard? 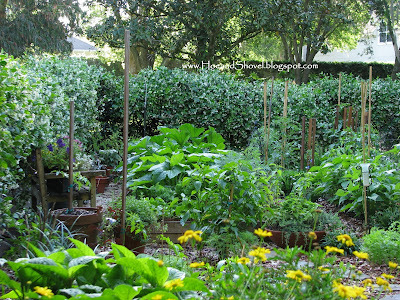 Wow, your veggie garden certainly has grown! It looks beautiful -- and delicious. I, too, am enjoying my good Old Faithful jasmine. Your post makes me realize it's been trying to tell me something: "I'm lonely!" 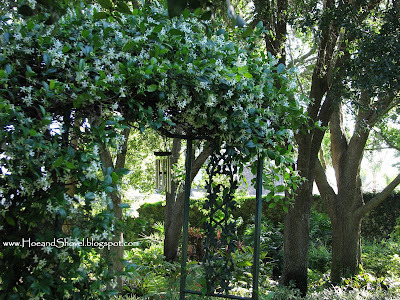 I loved star jasmine while we lived in California and miss it up here in Spokane. It definitely wouldn't stand up to our winters, but it is a remarkably tough plant in mild climates! I loved to smell it in parks and landscapes where it was used as a plant-it-and-forget-it groundcover. Amazing that some plants give so much with so little taken in return. No scents in the veggie garden yet here (there being no veggie garden tilled up yet, let alone growing). How about hamamelis, snowdrops and a little scent in the crocus? Oh, and the chives ARE awake. I forgot about them! I can smell your garden from here though, Meems. Wishful thinking on my part. I would so love to see more pics of your veggie garden. It looks like you have raised beds. It looks so nice and lush! I am off the read much more of your blog! This jasmine had ice hanging on it the second freeze we had and it never skipped a beat. Hmmm... I almost forgot about that. Do come by if you are over this way... we've got lemonade, too. Yes, the veggie plot used to be the doggie hang out. For many years I left it vacant since one has to purpose to see it. Now it's like my own private garden. The veggie garden is growing so fast daily I can hardly believe it.Today I was securing a green bean plant and lo and behold - there were beans ready to pick. It's like that in a garden. Surprises all the time. 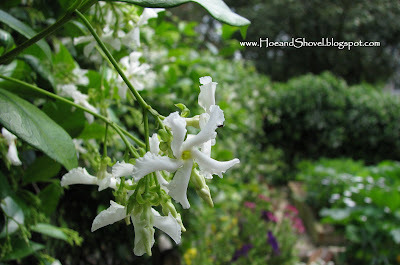 Hey!You know... really there aren't too many plants in my garden as fragrant as the jasmine. I might need to see about adding some more. Don't worry... I'll be coming to your garden in a few months for some good veggies and beautiful flowers when mine is long gone due to the heat and humidity. I have 2 framed beds and the rest is hilled up. This year when I didn't(read:ran out of budget) want to pay for more framed beds and I wanted to expand the size of the garden I opted to try it the traditional way. It is working just fine but I have to say I still long for the framed beds. maybe for my fall garden???? Thanks for taking a look around. Everything is looking lush, with no evidence I can see of damage from the cold temps you had awhile back. i enjoyed reading about your garden and jasmine. It's beautiful! Jasmine is another plant my mum grew in Australia and I love it dearly. The scent is devine! Your Jasmine is spectacular, Meems. It looks wonderful covering the fence. You're surrounded by beauty in your garden, and the veggies garden is a work of art too. 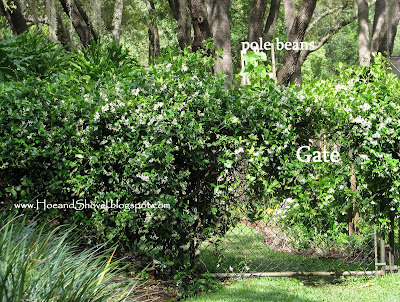 i love the fact that the jasmine covers the fence and adds needed protection, all the while scenting the air. your veggies from this morning look amazing. the colours are so vibrant...i am sure they are delicious too. So glad you stopped by. We do still have signs of damage from the freezes but certainly none on the jasmine. It never blinked an eye through all that cold weather. The jasmine is one of those plants you can completely leave alone. Well, except for trimming occasionally it because it would try to join with the neighbor's hedge if I didn't. It's a great plant I'm glad I located it there years ago - now that I'm over on that side of the house in the veggie garden I'm certainly enjoying it more. I had gone out to the garden to get some lettuce for a lunch salad and ... wow... I started pulling up the carrots and radishes and then I saw more peppers... it's just that way right now in the garden... full of surprises. Hi Meems~~ I love Star Jasmine. It would be cool to grow it abundantly like your beautiful photos depict. Mine is a humble affair. More so now thanks to an unseasonably cold winter. Your garden is absolutely magnificent. I bet you have a hard time leaving it. After two season here our Confederate jasmine didn't survive the winter this time... What a lovely harvest you are having! I have that jasmine! Smells delightful as you say too! Your garden is so very lovely to see. Wow, have you become quite a veggie gardener in short order! I also can't resist crushing and inhaling my herb leaves when I go into my garden. Also my bayrum and pimento tree leaves. My first thought was "jasmine." You just can't beat the wonderful scent. I wish I had a fence of it! When I lived in Houston, I had a couple of wonderful tropical jasmins. One was angel jasmine, and another poet's jasmin. Both were vines with wonderful fragrances. 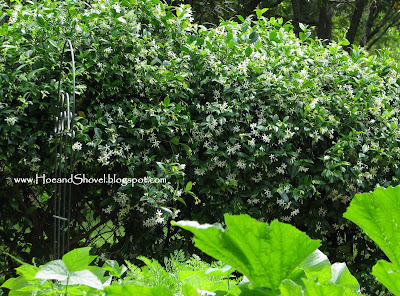 But the king of scented jasmines was the night bloomng jasmine that was a shrub. It grew from a tiny plant to a 10'foot tall specimen in one year. The fragrance could be smelled for maybe a block away. I made cuttings and would often have people asking me what that wonderful scent was and then taking home their own plant. Alas, an early freeze caught it unprepared and it was killed. I've always loved the smell of tomato plants, even when I worked 16 hour nights as a truck driver hauling tomatoes and was exhausted and sick of just about everything else to do with tomatoes. I'm about a month away from getting that scent back in the garden.